A lot more than just a protein powder, this jar contains the best pure vegan protein, formulated so as to maximize the usefulness of this protein, maximizing the potential for muscle repair and building. Nothing else on the market comes even close. The results can be experienced almost immediately, depending on the intensity of the exercise and regularity. Feel the difference and unleash your inner caveperson. There is at least 175g of pure protein in a 300g jar. 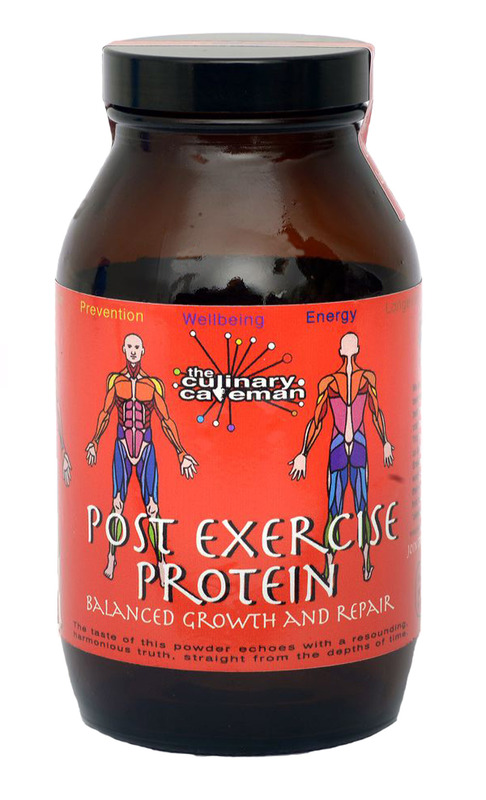 Protein that is not only full of the essential amino acids, the formulation has balanced as many co-factors as is possible to maximize bio-utilization of this protein for muscle repair and building. Post Exercise Protein is more than just protein in a perfectly balanced package, it’s from plants, is vegan and raw, providing protein that has none of the serious health risks (from osteoarthritis, MS, Crohn’s to cancer) that are increasingly being associated with animal sourced protein. Essential Omega-3 is provided by the seeds and almonds, whilst the enzymes papain and bromelain guarantee the best possible digestion of the protein. Banana further aids digestion, being a probiotic, feeding the healthy digestive bacteria and aiding sleep patterns whilst cocoa aids production of serotonin and other hormones. Vitamin A aids in the biological use (eating anything high in protein removes vitamin A from the system, so this has to be replaced) and optimizing health, hence spirulina, whilst the seeds provide the fat required to absorb the vitamin A and much more. Liquorice acts as a harmonizer, bringing the ingredients together, as well as imparting a sweet taste. Dried at a very low temperature, so qualifies as a raw food, retaining as many of the nutrients as possible.